Mental Health Awareness Month was created in 1949 by Mental Health Connecticut’s national affiliate, Mental Health America, to raise awareness about mental health conditions and the importance of good mental health for everyone. This May, MHC is honoring this tradition by hosting 31 Days of Wellness! The U.S. Surgeon General (1999) and the WHO (2001) cite stigma as a key barrier to mental health care, including seeking and sustaining participation in services. Eradicating the stigma and social distancing of individuals with a mental health condition must be a top priority in order to improve worldwide mental health. On Saturday, May 4, join us for an afternoon of competitive axe throwing where we will be “Chopping Down Stigma” to benefit Mental Health Connecticut and its mission of improving mental health for all Connecticut residents. $40 per person, advance registration only. To register – go to www.mhconn.org/Chop. Join us at Sea Tea Improv Theatre in Hartford on May 9th for an evening of powerful story telling from this year’s Write On! program participants. MHC’s Write On! program is a writing workshop that teaches individuals with diagnosed mental health conditions and/or substance use disorders to find their voice and write their truth as mental health advocates. Registration will open in April. Mental Health Connecticut is a proud sponsor of the 2019 NAMI Connecticut Walks, held on May 18th at Bushnell Park in Hartford & Sherwood Island in Westport. Visit https://secure.qgiv.com/event/walk2019/ for more information. Join us on May 20th as the Hartford Yard Goats play against the Erie Sea Wolves at Dunkin Donuts Stadium in Hartford, CT. MHC is proud to partner with our friends at Aetna who are hosting a pregame mindfulness event in the Aetna Community Room of the stadium. Arrive at 5:30 p.m. to check in with MHC staff (everyone who purchases a ticket through MHC’s link BEFORE May 6, will receive a FREE hat! ), collect a swag bag from Aetna staff full of great giveaways, and take a moment for mindfulness in this instructor led session. Then join us at the Concourse for wellness info and a chance to win great prizes from MHC. The game starts at 7:05 and we can’t wait to share the evening with you and your family! Purchase tickets through the MHC link at https://groupmatics.events/event/MentalhealthCT. Every day in May will represent an activity that MHC will host across the state of CT. With the support of our Board of Directors, Development Committee members, friends in the community, and dedicated staff – we are filling our calendar with special events, social media updates, restaurant donation days, sports outings, and more! 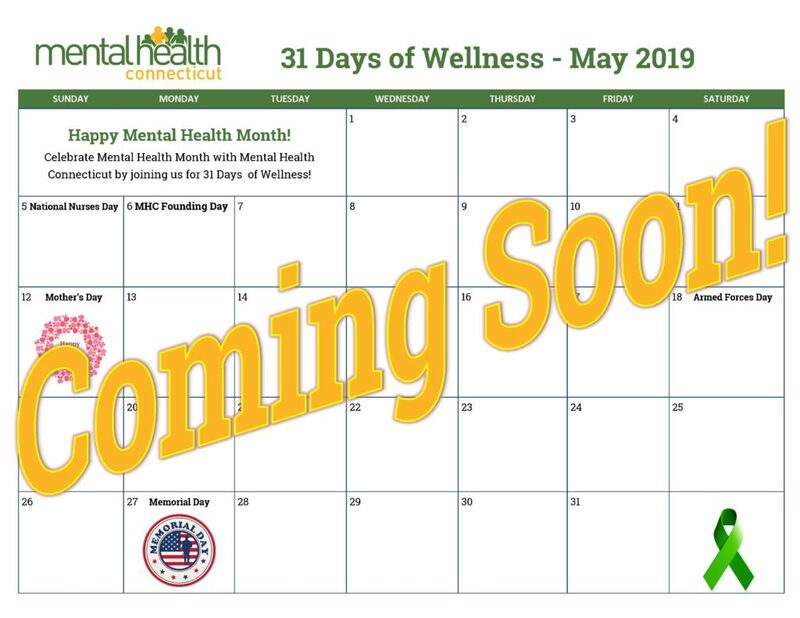 Save the Dates (May 1-31, 2019) for 31 Days of Wellness!